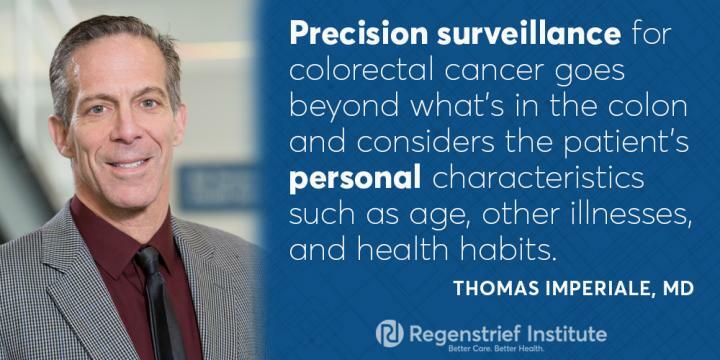 INDIANAPOLIS – The interval at which an individual undergoes a repeat colonoscopy because of previous pre-cancerous polyps — a practice known as "surveillance" — should be tailored to the individual and not simply be determined by the results of prior colonoscopies, according to Regenstrief Institute research scientist Thomas F. Imperiale, M.D. In an editorial in the American Journal of Gastroenterology, he calls for "precision surveillance," a phrase he has coined to echo the personalized, targeted focus of precision medicine and the application of these concepts to colon cancer screening and surveillance. "The goal of colorectal cancer surveillance is to reduce incidence and death from colorectal cancer," said Dr. Imperiale. "The only factor we currently consider for whether and when to do a surveillance colonoscopy is the number and size of precancerous polyps found on a previous colonoscopy screening. No other factors are considered; this practice does not always make good clinical sense. "Precision surveillance goes beyond that one element (what's in the colon) and considers the patient's phenotype – personal characters such as age, personal medical history, BMI (body mass index), and health habits such as smoking. And when the data become more widely available, consideration of when to rescope should include the skill of the colonoscopists who performed the previous colonoscopies." Dr. Imperiale says that his editorial, "Thinking Big About Small Adenomas: Moving Towards 'Precision Surveillance'" is a small step toward advancing surveillance colonoscopy by expanding the proportion of persons considered "low-risk" from one or two small, precancerous polyps to up to four such polyps. The giant leap, he says, would be to employ precision surveillance and make screening recommendations truly personalized and based on the patient, their polyps, and their colonoscopist. Although studies suggest that the smaller the precancerous lesions are, the longer it takes for them to become cancerous, scientists do not have an accurate picture of the natural history of these lesions because they are removed upon discovery. It is known that most do not become cancerous. "While we want to keep an eye on those individuals who have shown they can grow precancerous polyps, we need to balance being appropriately aggressive in those with whom we should be, with backing off from intense treatment for people who don't require it ," said Dr. Imperiale. "Precision surveillance starts to get at that issue." As an example, he contrasts two hypothetical patients — a healthy 55-year-old and a 70-year-old on home oxygen or dialysis. Each is found to have one or two small precancerous polyps. Current guidelines call for the same five- to ten-year interval for a repeat colonoscopy; most colonoscopists would re-scope at five years. Dr. Imperiale says that colonoscopists need to use their judgment and discuss with each patient when and even if to repeat the colonoscopy. For the 55-year-old he would recommend a repeat colonoscopy in five to ten years or sooner if symptoms appear or other concerns arise. For the 70-year-old with significant health issues he would discuss with the individual and relevant family whether the best course might be to forego further colonoscopy simply to look for any new polyps. "To provide the best care to patients and use healthcare resources responsibly, we need to be more thoughtful about certain factors in addition to the results of previous colonoscopies," said Dr. Imperiale. "We need to screen and re-examine those who need it most and not those people who won't benefit. Precision screening and surveillance may help achieve that goal." In addition to his Regenstrief Institute appointment, Thomas Imperiale, M.D. is the Lawrence Lumeng Professor of Gastroenterology and Hepatology at IU School of Medicine and a core investigator at the Richard Roudebush Veterans Affairs Medical Center.